Every few months, Son and I go out to eat KBBQ with some of his old coworkers. Charred meat, a huge variety of banchan, your clothes smelling like KBBQ all the way home… what’s not to love? Unless, of course, you’re the one vegetarian of the group, who always gets stuck in the corner, marinating in meat smoke while noshing on whatever meatless dishes the restaurant happens to serve. To make up for that, every time we have a potluck, I try to make some hearty, delicious meatless dishes that our token vegetarian can enjoy. Especially when he’s the one hosting – it just seems so wrong to bring a meaty dish to a vegetarian’s house. One of the sushi recipes that I make most often for potlucks and at home is my Spicy Shrimp Inari. It’s simple and delicious… and, as it turns out, seriously easy to convert to vegetarian! 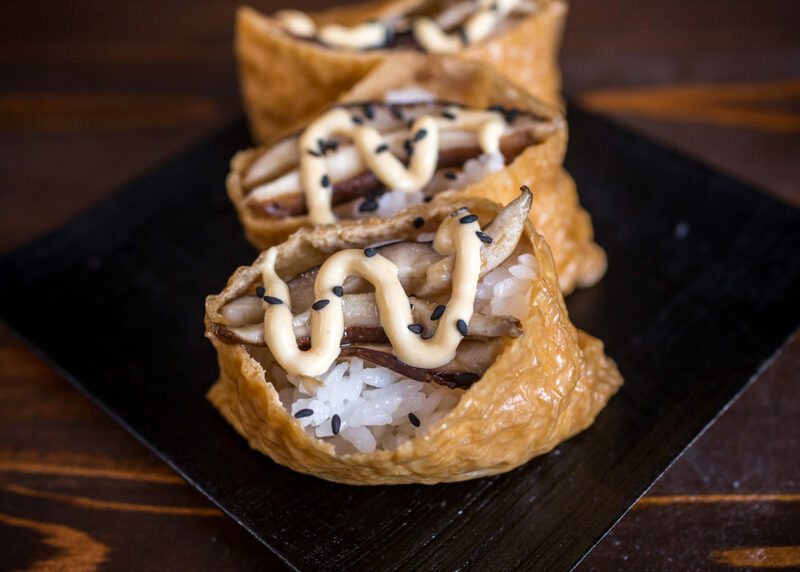 Now, this new mushroom inari recipe, along with my Vegan Sushi, are my go-to recipes when I know vegetarians or vegans will be present. Both are easy to make, and both are delicious enough that even serious carnivores love them! Slice the mushrooms into long slices, then cut each slice in half if needed. Sauté the mushroom slices in the sesame oil until softened and brown. Mix the mayonnaise and Sriracha sauce until well blended. Stuff each pouch of inari with about 1/4 cup of rice. 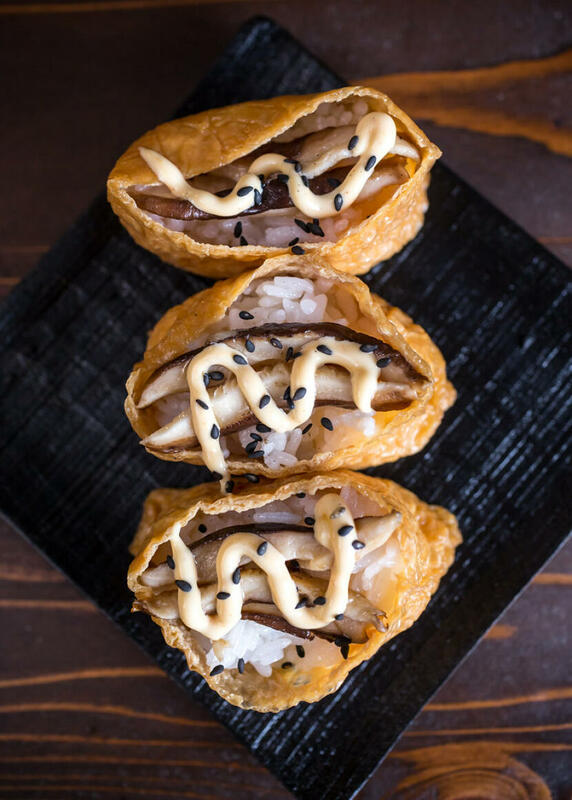 Lay a piece of mushroom on top of each stuffed inari. Drizzle a little spicy mayonnaise over the mushroom. Sprinkle sesame seeds over the sauce. It takes a bit more effort to be a thoughtful host/ess for your vegetarian guests. At least they tell you ahead of time. Sometimes it’s an unpleasant surprise. Falafel is my latest vegetarian go to dish. One of the most ingenious ways I’ve seen mushroom used all week. Vegan sushi, open your door and lay out the red carpet. We have an innovator! Hey hey, what fancy vegan bites. Mushroom does have a quite wonderful flavor and it’s texture complements it’s Salmon predecessor very well. Thank you! I really appreciate the extensive insight into the elaborate aspects of this skilful culinary art form. This blog does it the justice it deserves. Thank you for all that you have shared with us! Just plain fantastic how mushroom gets a long with sushi. Out of the thousands of different edible mushrooms, imagine the potential. Great post! The mushroom renegade strikes back sushi style! wow! this looks delicious and wonderful. I like how your version looks! I have officially coined August as mushroom month. A feeble attempt to strike the vegetarian cords in me, let us see how it goes. And this has got my love for sushi covered for the time being. Wish me luck. Thank you for sharing this recipe. It is really a great dishes for those vegetarian and sushi lover. What a healthy and delicious food indeed. What a great idea for a vegetarian recipe. Thanks so much for this. I love inari. They’re not good for you and so sweet but i do love them. 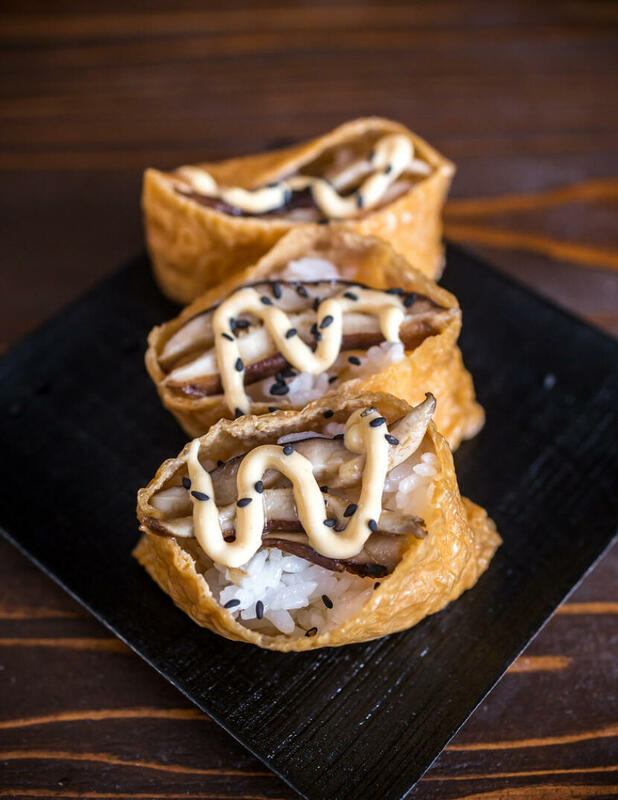 Not thought about this as an option but i’ll give it a go next time I make inari. Good for my vegetarian friends too. Will try to cook it for my girlfriend tonight. Thank you! I find this very good for me, in order to keep fit, I like delicious meatless dishes very much. It looks delicious and very good! I love Japan and its food and culture! I love the recipe that you have made. I going to try it as well. Wow, this looks yummy. I love how delicious it is. You’ve inspired me to try to cook the same thing. It looks delicious. Thanks for sharing this recipe. Takes courage and love for food to try this, I got it all.